Jane Evansdale was born in Liverpool, England, the daughter of two physician surgeons and the youngest of 7 children. Far from being the "spoiled brat", Jane watched as her siblings were all nudged gently into the medical profession, then rebelled when it was her turn. Jane excelled at Science courses all throughout her school years and had always had an intense curiosity about the world and how it all came together and worked. After graduation at 16, she enrolled at King's College in London and threw herself into her studies: biochemistry, biomedical and health sciences, and biostatistics and computing. Upon graduation from college, she applied and was accepted at Star Fleet's Academy in San Francisco, telling her family that "one planet just wasn't enough". Upon graduation from the Academy, Jane was assigned to the Academy's Jupiter Station facility for further study. She was excited to be leaving planet Earth, but looked back at the big blue planet fondly. Then she turned to look towards Jupiter and has never looked back. After 2 more years studying everything that was currently known about the other galactic races and their home planets (and colonies), Jane was ready to move along. 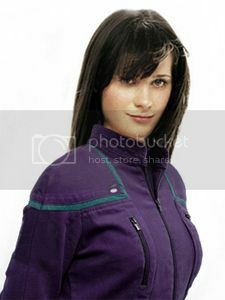 She applied for and received a berth on the NX-04 Challenger as Exo-Biologist.